For making ganache, I'm using piping technique. Ratios are 1:2 for dark, 1:2 for milk and 1:2,5 for white. It works well with milk and white. But with % 60 dark, for 1:2 ratio, after room cooling, ganache don't form a skin which I can see on milk and white ganache. My milk and white ganache forms pudding like texture and can be cut very cleanly with a knife but dark ganache doesn't form this pudding like texture and looks a little bit grainy and when cutting, after cooling, it breaks and sticks to knife. 1:1,25 ratio gives me good results and these problems disappear but in this case ganache is very soft and not workable. What can I do for solving these problems? By the way, I want to say that "Chocolates & Confections" is really great and it has given a lot of answers to my questions. Maybe adding a few percent of pure cocoa butter would help? These are supposed to be piped out on 25mm disks, and my stencil was pretty close at 28mm. The directions call for a size 2 piping tip which I quickly realized was not the system my tip set used. The size two is the second smallest tip and wouldn't work at all. My first attempts used the number 7 and 12 tips. The first was too small and the second too large, so I went shopping and found a 10 which seems to be approximately the correct size. I was a bit careless with my first batch of ganache and it wasn't in temper which caused quite a bit of heartache in piping. It took a long time to set, and then it melted unevenly in my hands in the bag resulting in a slumped pile rather than anything resembling a beehive. Refrigerating it didn't help much as it was then too stiff or too soft. Finally I broke down and carefully made a half batch according to the instructions and the plasticity was perfect. The ones in the photo come from that batch. My piping skills need to be honed yet as mine don't look nearly as like a beehive as the author's do. I piped the honey with a number 2 tip and would suggest you try something closer to a 3 or 4 as it took too long to fill. I was concerned that I might be putting too much honey in each, but upon tasting I found that it wasn't as noticable as I thought it would be. The Buckwheat honey compliments the milk chocolate very nicely. I brought the batch in to work and they went pretty quickly with universal appreciation. They are supposed to be topped with large granual sugar, but the closest I could find was a natural sugar that was brown rather than bright white. Still, they turned out fairly well. Nicely done. I've been eyeing that recipe. I was close to starting it a few weeks ago when life interfered. Those look pretty beehivey to me. On the cover of his book he has the lemon logs. I'm looking for the sanding sugar he is using in that recipe. Is this regular sanding sugar? It looks bigger than regular sanding sugar to me. Anyone have any ideas? Thanks for the compliment. I chose the best three for the picture and arranged them for best effect. Quite a few looked like a Hershey's kiss or more of a blob. You also want a nice thin dipping chocolate so you don't hide the ribs. Mine was a touch too thick. I would certainly suggest giving this a try. I'm not a big honey eater, but the balance is really good with this recipie. It's also a good way to practice your piping skills, which is why I chose it in the first place. Do you know where to get large granual white sugar? People more familiar with the book may give you more specifics, but the selection at India Tree is pretty impressive when it comes to that type of ingredient. Do you mean sanding sugar like you use for pates de fruit or courser than that? I get my sanding sugar from a bakery supply place. The courser white sugar I've seen at places that sell fancy coffees and teas. I'm not sure just how large they are, check out the picture on page 112. The crystals appear larger than any I have seen before. They appear courser than sanding sugar by a fair amount. Yeah, it looks bigger than sanding sugar to me and it looks a lot like the stuff that Rob has linked to. I just checked where I get my sanding sugar and they sell one called course sugar as well, I'll have to pick some up next trip. could be coarse or what is sometimes called AA sugar (double A sugar) or crystal sugar. I think this is the stuff as well. India tree calls it decorating sugar. I just happen to come back from the supermarket, and they carried it, but i'm looking for the clear stuff. It's definatly larger than sanding sugar. just as an aside, india tree is very expensive. you can find the stuff much cheaper elsewhere. But Peter says that there are two reasons for separation during makeup: Excessive fat and stirring at unstable temperature. So I thought that I should decrease the butter ratio in the emulsion. This is the reason for decreasing the chocolate ratio and I can get good results with 1:1,25 ratio. Maybe low cocoa butter ratio in the chocolate may give more satisfactory results so I can increase the chocolate ratio in the emulsion. I'm learning this job from the books and have never seen a master when working. My 1:2 dark ganaches have never separated as in the picture in the book showing separated ganache. But I always get two types of ganache from my experiences: With skin after room cooling and without skin after room cooling. I would like to ask an question to clarify this point for me: If the ganache does not form a skin after room cooling, can we say that it is properly emulsified? That is, can we say that correctly emulsified ganache always form a skin after room cooling? I don't know if you can say that a properly emulsified ganache always forms a skin. I've never actually made note of which ganaches do that, although I have noticed it at times. I wonder if your milk and white ganaches forum a skin due to the extra protiens present from the milk and white chocolate, which is lacking in dark chocolate. The grainy nature of your dark chocolate ganache could be due to lack of emulsion, when you are mixing it initally do you get a nice shiny smooth mixture before you pour it out? What method do you use to mix your cream and chocolate? I make my ganaches by just melting the chocolate, heating the cream separately then combining the two. In deference to those who think that ganache should be in temper to increase the shelf life I try to keep my temperatures in the low 30's. I use a silicone spatula to mix. As I stir at first nothing seems to come together, but as I continue to stir, suddenly the whole thing gets shiny and glossy and I know I have my emulsion. If this just doesn't seem to be happening in a reasonable time and it appears that my ingredients may be a bit too cool, I will sometimes put it in the microwave for 10 seconds at a time before stirring some more. This is rarely required. At this point I add my glucose and alcohol etc. When it cools to room temperature I stir in my soft room temperature butter. If I find that my ganache is too soft to cut or work with, then the next time I make it I increase the proportion of chocolate to cream, or add some cocoa butter. I'm not using the slabbing technique for it requires temperature control everywhere in the process. I'm using piping technique as described in the book to make a ganache and sometimes finishing with slabbing technique, that is, I pour my ganache to a mold and after cooling, cut it into squares. Skin appears to me as the most noticeable feature at the end of the process. Let me try the complete slabbing technique and see the difference. Thank you for your detailed explanation. Decided to make some nougat today. Went with the chocolate variation. 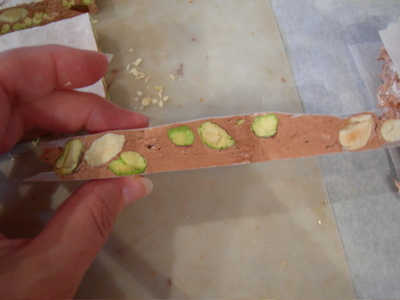 Interesting how much chewier a nougat Greweling's recipes make vs other recipes I have made in the past. I used pistachio, almond and in place of the dried cherries I used some candied orange rind that I had dried well. I wonder if I wanted to make it a little less chewy if I should add a bit less albumin or take the sugar syrup to a slightly lower temperature. Kerry to be honest when I make chocolate nougat I use your recipe, I add chocolate and it always turned perfect ( of course )I have notice that if I ground the chocolate instead melting it the texture is better. In the recipes that use purees, it is always stated to reduce the puree by half. I assume the weight given is after the puree is reduced? Has anyone made any of these to verify this assumption? In the recipes that use purees, it is always stated to reduce the puree by half. I assume the weight given is after the puree is reduced? Has anyone made any of these to varify this assumption? yes, the weight that is used is after reducing it down. I had the same question when I looked at some of the recipes. Let us know, how it turns out for you. I tried the pear ganache recipe. I started really late so I didn't temper the chocolate (I assumed this step is to help extend shelf life). It said to let it sit out overnight to set. In the morning it was still much too fluid so I out it in the frig. It set up & formed a skin on top. After putting a foot on, I turned it over to cut. But it was still much to soft. I doubt this is not due to not using tempered chocolate. Has anyone tried one of the recipes of this variety? Was the ganche firm enough to cut? I will try one of these again but will probably cut down the liquid content to get a firmer ganache. The chocolate is 63% of the weight and liquid added was 37%. I was going to lower the liquid portion to ~30%. The ganache filled the size frame with not really any room to spare. If you want an alternative to getting bars (and you will not need to even the surface with a spatula), look at the adjustable cake square from Pastry chef. It will allow you to easily cut the recipe in half or make a full size protion with the same form. Greweling uses a different method for piped vs slab ganaches, and seems to be suggesting if you follow the correct technique that it will set up firm enough. I think we need to play a little. I was planning on trying again. I just have to plot out my next move. 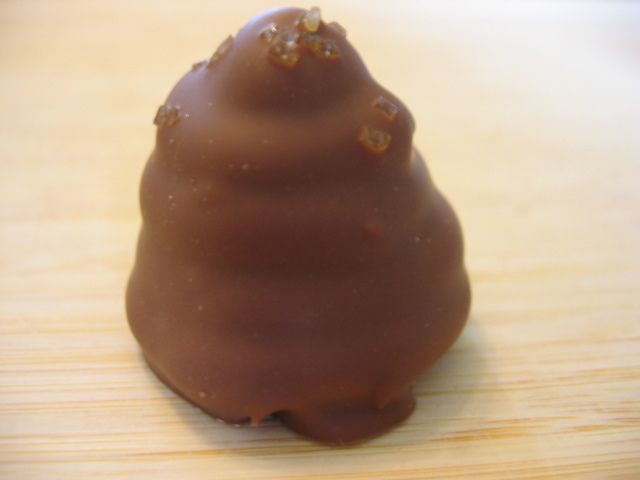 I added a bit more chocolate to gananche & if it firms up enough, I 'll use it for truffles. 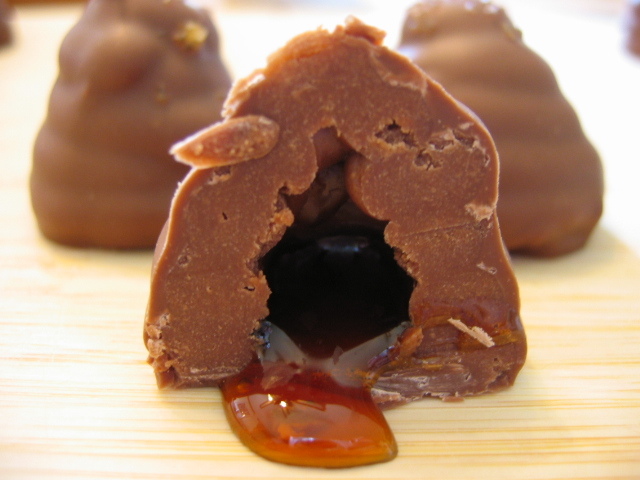 If not for some molded chocolates. I need to make some samples anyway.